I love shopping at Kroger! They always seem to have great deals and coupons. Right now they have a great deal for dog owners! You can save $3 on Purina® Beyond® Dog Food when you buy ONE (1) Purina® Beyond® Dog Food, any variety (3.7 lb or larger bag). To get this great coupon just log into your Kroger account and clip this amazing coupon. This offer expires June 29, 2017 so hurry and click HERE to load this coupon onto your Kroger loyalty card. 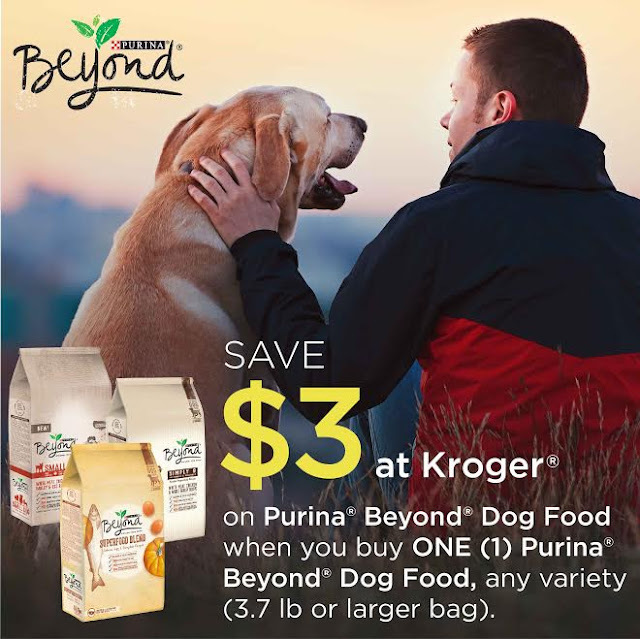 To redeem the offer just scan your Kroger card at checkout and the $3 on Purina® Beyond® Dog Food will be automatically deducted from your total. Visit HERE to learn more about Purina® Beyond® Dog Food. I've never heard of this line before. Glad it comes with a coupon to get a small bag to see if my furbaby likes it! My dogs LOVE beyond thank you for the coupon! My pets love Purina..... and I know Chewey says thank you for the deal! I will check this on eout the next time I go to the store. Purina is a great product at a great price.